FANBOY PLANET.com . 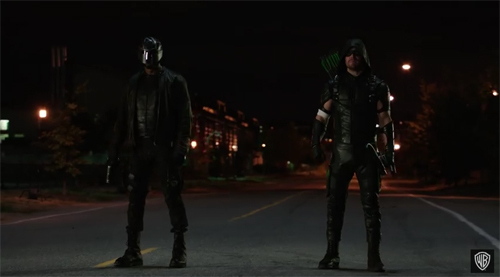 : Arrow Season 4 Trailer :. Just yesterday I was in a conversation about how The Flash has led people back to Arrow, which I I admit, was always a strong show. If you're still on the fence, take a look at this trailer, which premiered at Dragon Con in Atlanta on Friday. We get Star City, in what must be a bit of a set-up for DC's Legends of Tomorrow. We get a happy Oliver Queen. We get Constantine. We get Damien Darkh. And we get an armored Diggle in a costume -- or as the WB press release puts it, "inaugural form of concealment" - that must soon be arriving in the DC Comics' universe. I know what I'm catching up on tonight.